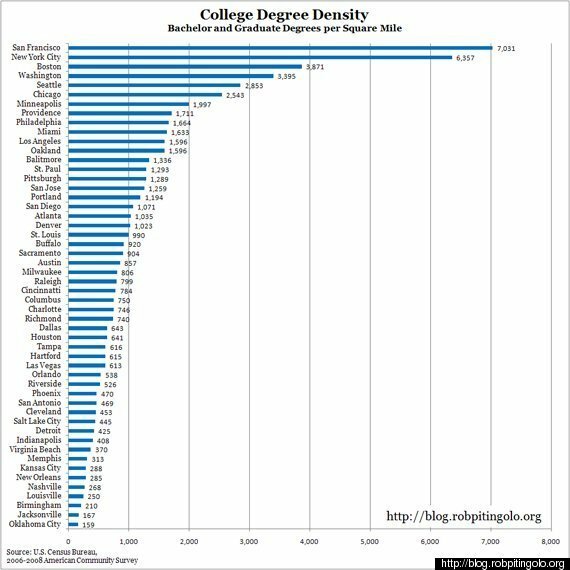 Recent John Carrol University graduate Rob Pitingolo was interested in finding out the "educational attainment density" (read: number of college degree-holders) in American cities. So he gathered the data and charted it -- and what he found is visually revealing if not surprising. San Francisco leads the pack by a considerable margin with more than 7,000 degrees per square mile, followed by New York, Boston and Washington, D.C.
Pitingolo lays out the data and more on his blog Extraordinary Observations. What's your take on this chart? Let us know in the comments section.